The Kolkata police notified on Wednesday evening that only 62 roads in the city will be barred, some partially, for cyclists. Its earlier decision to restrict cycling in 110 city roads had faced widespread criticism. The new directive, issued in the name of city police commissioner, Surojit Kar Purokayastha, will be implemented “with immediate effect” and is clearly a climb down from the police department's earlier directive that banned cycles and other non-motorised modes from 174 roads of city. The move follows close on the heels of activists filing a public interest petition in the state high court, seeking withdrawal of cycling ban. However, making a differentiation between cycles and other non-motorised transport modes such as cycle van, hand cart and pull cart (mainly used for goods transport), the latest order states that the restriction will continue on all the non-motorised transport modes other than cycles on the 174 roads. While cycle will be banned for 24 hours on some key thoroughfares, in others the restriction will be limited mainly to day time. The earlier order, dated May 29, 2013, was condemned nationally and internationally. Instead of curbing cycling, most international cities promote it in their effort to reduce carbon footprints and counter climate change. The order was also criticised by people in the city who use cycle as a daily transport. Confirming the new order, city police commissioner says, “We have finalised the new norm about cycling restriction considering all factors especially safe and uninterrupted movement of vehicular traffic.” The order has been notified under “sub-rule (2) of rule 291 of the West Bengal Motor Vehicles Rules, 1989”. The earlier order was issued under the West Bengal Traffic Regulation Act, 1965, and required an approval from the state government to remain in force beyond two months. According to documents available with Down To Earth, the state transport department had refused to ratify the earlier order of the Kolkata police, making it necessary to issue a fresh order under the new Act. “The new notification will not require any ratification from the state government and will be permanent in nature,” says city’s deputy commissioner (traffic) Dilip Adak. The important roads, which were banned for cycling in the earlier order but are now free of the ban, include Amherst Street, Beliaghata Main Road, Tollygunge Circular Road, B T Road, Bidhan Sarani, C I T Road, Rashbehari Avenue and Harish Mukherjee Road. Thousand of cyclists use many of these roads every day. The ban, however, will be in place for most of the flyovers in the city. 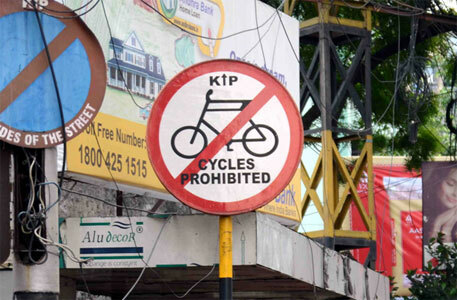 There will also be a 24-hour ban on cycles in major thoroughfares such as Park Street, Shakespeare Sarani, Red Road, Camac Street, B B D Bag (North, South and East), Council House Street. “It is a victory for our sustained struggle, but we will continue to fight for our right to ply cycles safely in as many roads as possible,” says Prasanta Purokait of Calcutta Cycle Arohi Adhikar O Jibika Rakkha Committee, a platform for cycle users in city. Purokait had earlier moved court against the May 2013 order. As per a rough estimate, around 350,000 people in the city use cycles. “This is our first round of victory, but is very important in a city known for high vehicular pollution. The government should also see that like most international cities, dedicated cycling tracks are built in major thoroughfares of Kolkata, and in areas like Rajarhat and Salt Lake which have wide roads,” says environmentalist Subhas Datta.